This is the final installment of the series on the efficacy Clarity Ferm, the enzyme that purports to produce gluten-free beer, from Dr. Chris Hamilton of Hillsdale College. The series began on Wednesday. Yesterday’s installment described the two sets of experiments. In the first, differing amounts of Clarity Ferm were used to treat different aliquots of cream ale. In the second, different mash schedules were used to produce a stout. 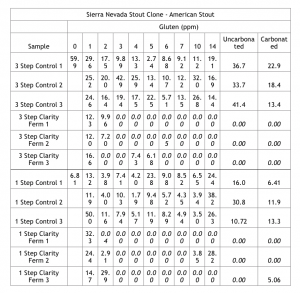 Clarity Ferm was added to half of the stouts. 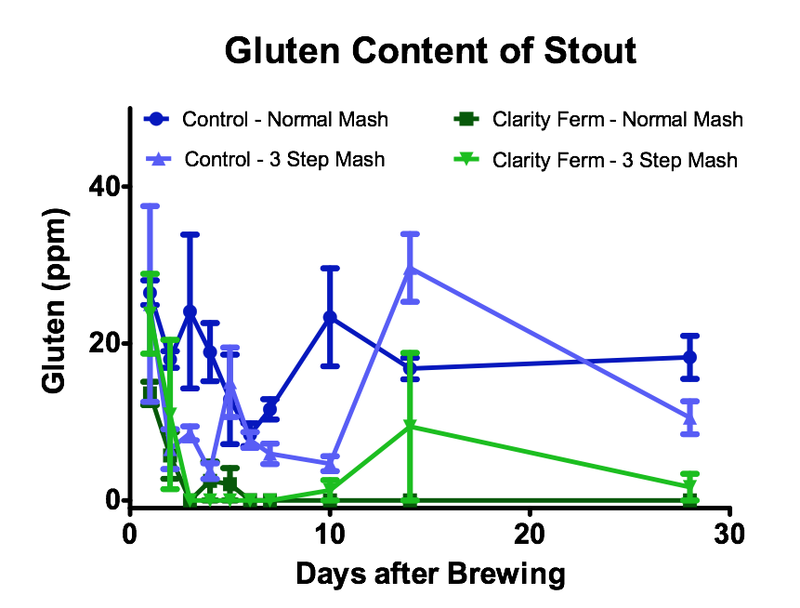 The idea was to test if a step mash — that contained a “protein rest” — would lower gluten levels by itself or in conjunction with Clarity Ferm. Here are the results. Hear an interview and tasting of samples on Basic Brewing Radio – September 4, 2014. Both analyses of the beer showed significant reduction in the amount of gluten. There was some variability in the data, but it was within the expected range. All of the treated beers contained less than 5 ppm of gluten, in fact the carbonated beers C, D, and E — the treatments with the highest levels of Clarity Ferm — had levels so low they cannot be quantified. There is some variation between carbonated (bottle conditioned) and uncarbonated (as seen in Figure 5). The uncarbonated beer was stored in a 50 mL conical tube, which appeared to cause some trub to be resuspended in the beer prior to analysis. While not tested, we believe this maybe the cause of the slightly higher gluten levels in the beer. 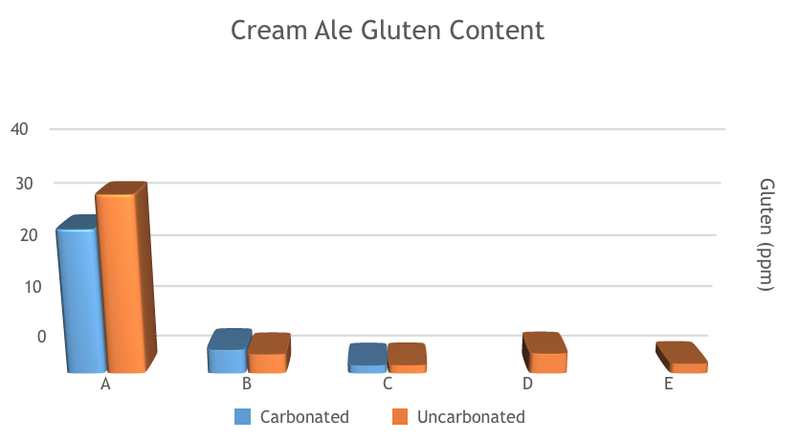 Figure 5: The average content of gluten in each beer, all treated beer has less than 5 ppm of gluten. 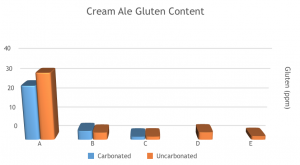 The data shows that the carbonated beers D and E had gluten levels below the limit of detection (less than 1.36 ppm of gluten), Beer C had levels just above this limit. By day three of fermentation, there was no detectable gluten in any of the Clarity Ferm treated beer. There were a few later samples that did show some gluten, however in all cases the two other replicates did not show any gluten. This may have been due to contamination or perhaps due to resuspension of trub in the beer. This possibility is supported by the fact that even the untreated beers showed a decrease in gluten over time. This decrease over time is not unexpected as proteins that bind to polyphenols and cause chill haze will settle out given enough time. 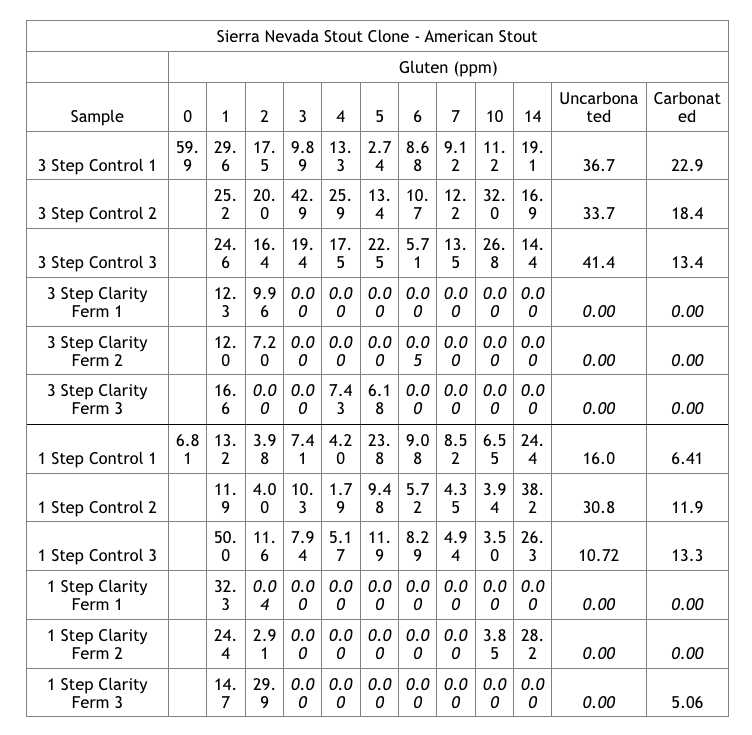 The Clarity Ferm treated beer had no detectable gluten after bottle conditioning with one possible exception; the earlier data on the beer showed no detectable gluten and the level was still very low (5 ppm). The data showed little difference in the mash technique used in the beer. It had been suggested previously that doing a protein rest might reduce the gluten content. 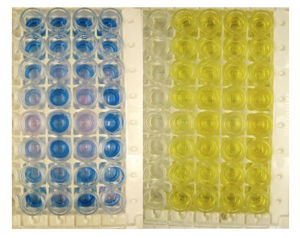 However, there was not any significant difference found in these experiments. Figure 6: Controls (in blue) show a slight decrease in gluten over time and after bottle conditioning has 10–20 ppm of gluten. The spike at day 14 seen in several beer was unexpected, in the case of the Clarity Ferm treated beer though only one of the three beers showed any detectable gluten (see table 1). The Clarity Ferm treated beer had no detectable gluten in 5 of the 6 samples after carbonation/bottle conditioning. It is clear from the data that the Clarity Ferm treated beer is essentially gluten-free and well below the 20 ppm standard. However, that leaves a few questions. Does the beer taste good? Does it taste the same as the untreated beer? The cream ale was tasted informally by at least 8 people (including a Basic Brewing Radio panel). While not rigorously scientific, most tasters had a difficult time distinguishing between the beers. Some tasters reported a slight difference in the beers treated with high levels of Clarity Ferm (beers D and E), however it was mostly in the mouthfeel of the beers and all tasters reported that they tasted good. The evaluation of the stout was more formalized, there were two different tasting groups. The first was made up of four people who judged the beers against the BJCP guidelines (Style 14e in the 2008 guidelines). All evaluators scored the beers blindly and then ranked them in 1st through 4th place — evaluators did pick up on some differences in the beers, but they were minor. The score difference between the 1st place and 4th beers was about 5 points for three of the four evaluators, one evaluator had a 10 point spread. The results here are quite interesting in that three of the four evaluators ranked one of the Clarity Ferm treated beers in first place; additionally one of the Clarity Ferm treated beers was also ranked in second place by three of the four evaluators. The overall lowest ranked beer was the control beer that had the 3-step mash, which was rated in 3rd or 4th place by all the tasters. The second tasting evaluation was done with a group of nine tasters, who had little or no sensory evaluation training. They participated in two different triangle tests, each test had the tasters compare two samples of the control to one sample of the Clarity Ferm treated beer. They took notes and tried to identify, which beer was different of the three samples (importantly, they were not trying to pick the better beer — just the different beer). The evaluators were randomly assigned to taste the single step or 3-step mash beers first. The results here were interesting too, if the tasters just guessed we would expect that 3/9 would be able to pick the different beer. The tasting of the 3-step beer found that only 2/9 were able to identify the Clarity Ferm treated beer as being the different one. Conversely, the tasting of the single step mash had 5/9 people identify the Clarity Ferm treated beer as different. The sample sizes are small, so it’s hard to draw major conclusions from this data. However, the data from the combined tasting evaluations suggest that with this recipe the Clarity Ferm treated beers taste better and that doing the 3-step mash (protein rest, beta rest, and alpha rest) it is much harder to distinguish the beers. There was also an informal tasting of the Stout on Basic Brewing Radio and the findings there support the conclusion that it is very difficult to distinguish beers treated with Clarity Ferm from those that are not treated. 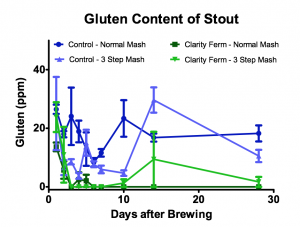 The findings of this research show that using Clarity Ferm to reduce gluten in beer effectively eliminates gluten, gluten fragments, and other similar proteins. Performing a step mash (with a protein rest) was not found to have any impact on gluten levels. The beers treated with Clarity Ferm were hard to distinguish from untreated beers. When ranked by taste, beers treated with Clarity Ferm often surpassed untreated beers. GREAT experiment and info! Thanks! Thank you everybody involved in this. Glad to hear all of you liked this! If you haven’t listened to the podcast, we also did experiments on a Wheat Ale (Oberon Clone) with Clarity Ferm. The results were very dramatic there. We’re continuing to do different experiments and I will be sure to update James when/if we have some results. If you’ve done any experimentation or have ideas for something, please let me know! Thank you for a well presented article – greatly appreciated. Very interested to know if any tests have been done to establish if any gliadins remain following the use of this product. I have Wheat-Induced, Exercise Dependant Anaphylaxis (WIEDA) triggered specifically by Omega-5 Gliadin, although I have had severe reactions to other gliadins and hordeins, suggesting a wider problem than the one specifically identified in testing. My concern is that the process of breaking down the gluten may actually leave the same amount of these proteins present, only split out from the complex chains that make “gluten”. If that’s the case, and with the increased prevalence of beers labelled GF in the UK and Europe treated with this product, I may have to step away from all GF labelled beers. Certainly Daura, a Spanish beer treated in this way gives me the classic burning digestive tract I’ve come to associate with exposure to these proteins prior to more severe reactions. If anyone is able to offer any insight, I would be extremely grateful. The test we use to detect gliadin is designed to test for fragments as small as 5 amino acids. Most other techniques used to detect gliadin only detect very large pieces. That said there is always a limit of detection and the epitope that the test looks for is one that is problematic for those with celiac disease. However, most of the other peptides/proteins should be digested normally if you have normal digestive proteases (pepsin, trypsin, etc.). If your issue is primarily involved with an allergy to omega-5-gliadin then the enzyme should work to degrade that protein and the test we use should pick up those protein fragments. However, if you are hypersensitive it is possible that levels even less than 1 ppm could cause issues. Unfortunately, the only way to know for sure if to use it in beer and try it under the supervision of an allergist. If you do have a reaction to that, unfortunately you would be limited to beers made with sorghum, rice, corn, or other non-gluten grain. By beers made from sorghum, rice, corn, or other non-gluten containing grains… you mean GLUTEN-FREE beers? Beers made without gluten. Beer made with barley is regular beer. Nothing is being removed. To label it GF and create confusion for people with auto-immune conditions is irresponsible at best. In my opinion, calling it gluten-free or low gluten is misleading. If celiacs dropped dead from anaphylactic shock, companies would not be doing this. Chris, thanks for that. I’ll speak to my allergist and see where this goes. I have been homebrewing for probably 8 years now and was recently diagnosed with Celiac Disease. To say this was a bummer was an understatement as my love for brewing and seeking out extraordinary commercial beer was such a large part of my life. Unfortunately, there is a lack of information on the brewing gluten free beers and a lot of what is available doesn’t seem definitive. The thought of having to settle for commercial gluten free and gluten reduced beers was depressing. This article is extremely encouraging, however. I’ll have to confirm Clarity Ferm works for me personally, but, given the detail of your experiments, I’m hopeful I can brew any beer I want now! Thanks again for your amazing research! My situation is similar to your own; I’d be interested to hear your experience with Clarity Ferm. I’m confident that the ELISA accurately measures the gluten (gliadin, horedein, etc.) content including the small digested peptides present. That said all tests have their limits, so can anyone accurately say there is absolutely ZERO gluten or fragments in the finished? No, but the level is extremely low and since the enzyme clearly works it most likely breaks down everything or very close to it. 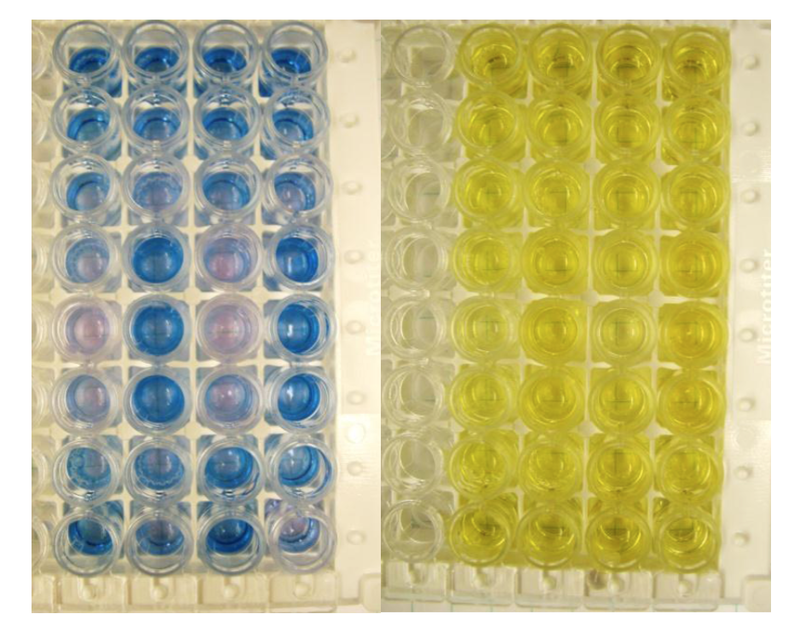 The antibody used is very specific for a common epitope in toxic peptides and the test we (and others) used will detect it down to less than 2 ppm. I’m not a medical doctor, but I believe that the possible trace levels of gluten remaining would be safe for many (if not nearly all) people with celiac disease. I do encourage people to err on the side of caution, to try small samples and discuss with your physician. I do know personally several people diagnosed with celiac disease that have no symptoms after drinking beers treated with Clarity Ferm or Brewers Clarax. Hi, have you tested this using hordeins as a control to assess the levels of hordein in the beer? This paper tests the levels of hordein with the RIDAscreen test and come up with variable results. Do you know where you can get pure hordein to use as a control for these types of experiments? I would be keen to try it. I have several family members with celiac disease and Clarity Ferm has been a blessing for them since they can now drink my homebrew. I am curious if any testing has been done on the enzyme activity when re-pitching onto a yeast cake. I typically try to get 2-3 batches out of a tube of yeast and didn’t know if I needed to add clarity ferm with each batch or if the enzyme would carry over and still work. any comments or literature would be helpful and thanks for the great article. I don’t know if anyone has looked into this. If I was brewing for someone with actual celiacs disease, I wouldn’t take a chance on the enzyme remaining active for that long. Great write up. I am an avid homebrewer and commercial beer geek, so I was bummed when I found out I had CD. Looking forward to trying this in my homebrew.